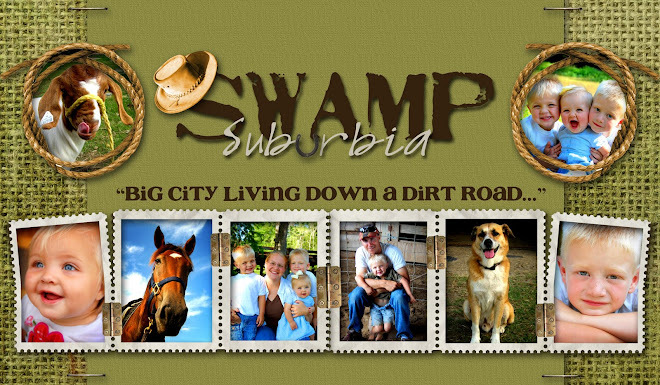 Swamp Suburbia: The Mean Eye. While living in the deep south I have learned many new things. One thing that my mother in law used to always say to her grandchildren was, "Look at my mean eye." She would say that while pulling down on her eye lid and showing her eye to the kids. I learned that this meant to watch what you are doing because she is watching you. The kids would all laugh and run away from her. They all thought it was funny. I have also learned that family traditions run strong down here. One strange "tradition", I guess that is what you would call it, was the family Elk. This Elk is old and huge. Mr. Elk has been in the family for about four generations. It has been hung in many of Mr. Cowboy's family's homes. We were helping his Grandmother clean out her back room when I saw the huge thing and asked if we could have it. Mr. Cowboy looked at me funny and said, "We don't want that". But as you can see, I am spoiled, and all I had to do was say, "Yes, we do, it would look great in our living room." Mr. Cowboy put up a small fight, but he is sweet and he let me win. Now, do you see what the south has done to me. I would have never begged for a dead animal to be hanging in my living room before I moved here, but now look at me. I was practically begging and pleading for the old dusty thing. We took it right off of Grandma's wall and loaded him up in our truck. Mr. Cowboy is very particular about things on our walls. He has to break out the measuring tape and mark up the walls with a pencil, just to make sure what ever he is hanging is done so with perfection. He would die if he ever took the picture off the wall that I hung. There are only four holes in the wall behind it. But, Mr. 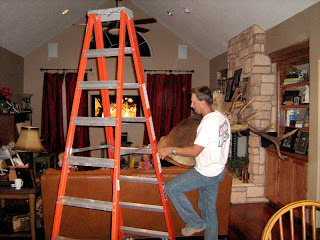 Cowboy being so particular, he grabbed that Elk and carried it up the ladder to position it on the wall so he could mark where to hang it. He only struggled a little bit with it, and he only kinda got mad at me for not helping at all. Now, you may all think that I did not fix the Elk's red eye, but no, that is not so. You see, this Elk is special. Remember how I said it was old and has been passed down through the family? Well, the family member, before Grandma, said that one day the eye ball just fell out. They didn't notice, so they just grabbed a red marble and some wax and stuck that marble into the eye socket. Definitely not the redneck thing to do. 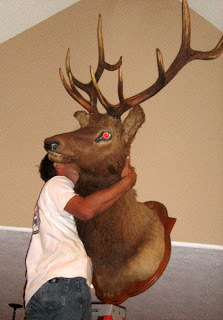 I now tell my Cowpokes to keep an eye on that Elk, because this Elk is very special. You see, this Elk has a "Mean Eye". And this Elk will tell me if any cowpokes are being naughty in the living room. This story only worked for about two days. Can't say I didn't try. 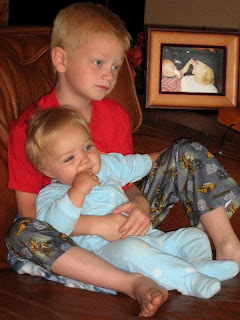 They were sweet to each other for a little while. I guess I need to remind them of the "Mean Eye". Oh Mr. Elk, watch over my children and keep them in line. 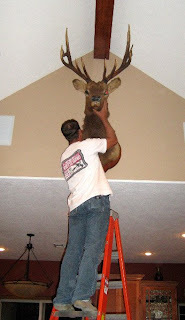 The Elk is so large that the tips of his antlers just touch our ceiling. He is one big boy. Grandma came over for a short visit the other day and said, "Grandpa would be so proud, he always wanted to hang that in our living room." Ah, yes, Grandpa, I can feel you smiling down on us now, or is that just that "Mean Eye"? Bwahahaha! Mean eye! Now that's too darn funny! With that glaring red marble eyeball, it sure looks more like an evil eye. Would make for a scary movie, eh? That red marble is too funny!! We have my grandfather's whitetail mount and my great-grandfather's muley mount too. They sooo need to be recaped but sure not going to get rid of them. 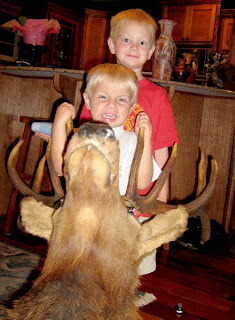 Very cool that you wanted to hand Mr. Elk in your house. 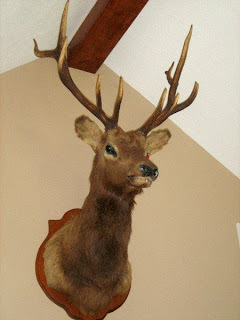 Mr. Elk looks great hanging on your wall and what a great story! The red marble-LOL!!! The mean eye, never heard of that, may have to give it a try! Loved the pics of Bear getting a bath!! I would have never thought that you'd hang that on your wall! Hi Andrea, remember me? When I first moved down south you, me, and Shannon hung out at the park with our kidlets. 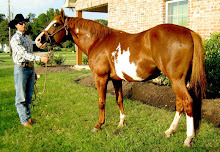 Yours have really grown and Cowpokette is so so cute in every pic! Your new home turned out so nice. Love your creative posts and sense of humor. Okay, this is how city-fied I am. That thing SCARES me! I would have to come downstairs, pull up a ladder and put a blanket over it before going to sleep at night. 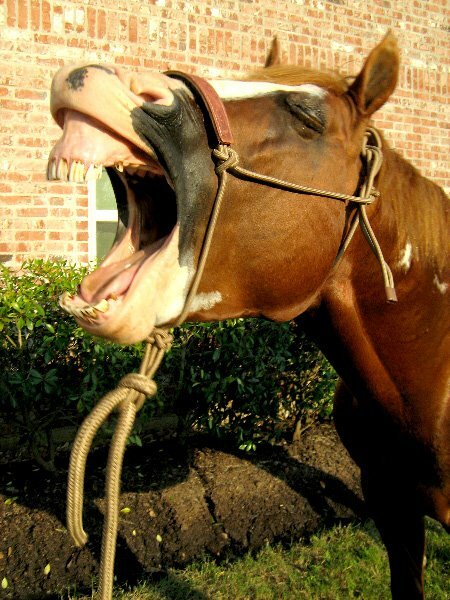 AUGH! The mean is watching me! AUGH! That is SOME ELK! Too funny! I keep tellin my fella if he gets anything like that he will have to build a "Man Room!" No dead heads in my house! I already have a mean eye! Me!! BTW when you get a min come on over, I got something you might want to see! Hope you are having a fabulous weekend!! We called it "the 'ole evil eye', I have also heard the saying of, "giving the stink eye". I wonder where these sayings originated from? Look! It's New York City!! Where the horses and their stuff reside.